I have had a bag of Butler Soy Curls in the back of my kitchen cabinet for about a million years, because I wasn’t exactly sure how to use this bizarre yet healthy ingredient. 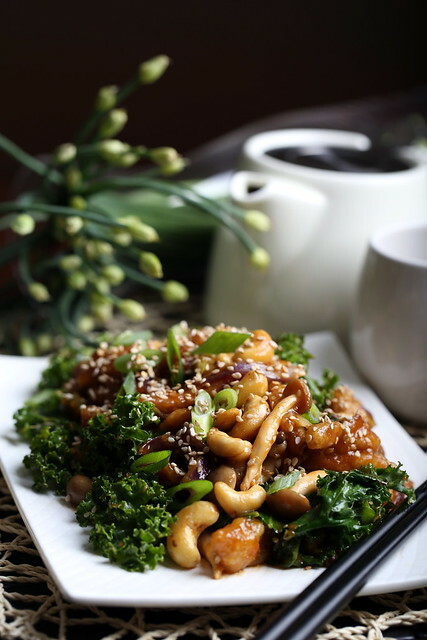 However, I got an intense craving this past weekend for this lovely dish, so I pulled out the bag of soy curls and got to work on whipping up something similar that would satisfy my craving. This this faux-meaty dish not only looked exactly like Chinese takeout, but also tasted just like the real thing. After my husband shot these photos, I asked if he wanted a bite. He tried a forkful, turned his head slightly to the side for a few moments, then pulled up a chair and proceeded to chow down until it was almost all gone. My vegan heart instantly swelled a few sizes seeing him relish the dish like this, making me an instant fan of this simple yet versatile whole food ingredient. Place the soy curls, broth and smashed garlic into a small saucepan. Bring to a small boil over medium heat, then turn the heat off. Allow the soy curls to sit in the hot liquid for about 10 minutes. Drain the soy curls using a fine mesh strainer, but reserve the leftover liquid to make your sauce. Place the soy curls into a towel and cover it with another towel. Put a heavy pan or pot on top to get some of the moisture out while you prepare your sauce and vegetables. Place the reserved broth and the rest of the sauce ingredients (except for the cornstarch/water mixture) back into the saucepan over low heat. Place plenty of vegetable oil (at least 5 inches high) into another small saucepan over medium-high heat. While it is heating (it will take about 7 minutes), prepare the vegetables by combining them into a in a large saucepan with a little oil over low to medium-low heat, stirring occasionally. 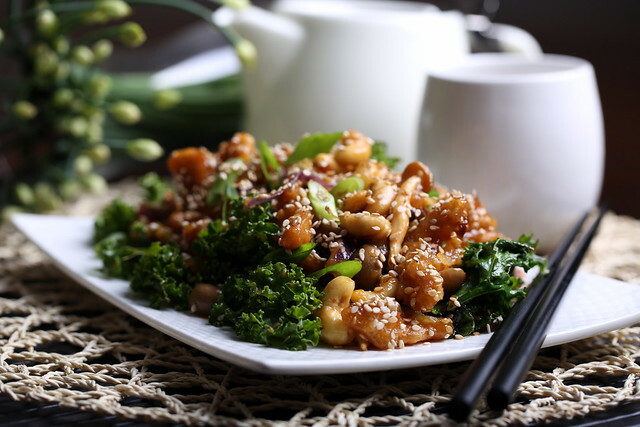 Now you should be ready to fry the soy curls. Place a wooden spoon into the oil, touching the bottom of the pan. If bubbles form immediately around it, you are ready to fry. Place the soy curls into the water/Ener-G mixture, then toss them into the cornstarch, coating well and tapping off any excess. Working in small batches, gently drop them into the oil, piece by piece, being careful not to overcrowd the pan. Allow to fry for 3-4 minutes, then remove them from the oil using a skimmer. Place them onto paper towels to drain. Repeat the process until all of the soy curls are fried. Return to your sauce. Increase the heat to medium high. Once it starts to bubble, add in the cornstarch/water mixture and stir constantly until slightly thickened. You’ll want the mixture to have the consistency of maple syrup. If it doesn’t thicken up after a minute or so, mix a little more cornstarch with water and repeat. Now throw the fried mock chicken into the sauce and stir gently to coat. Sprinkle with sesame seeds. To serve, place the vegetables into a bowl, then spoon the fried mock chicken over the top. Serve immediately with rice or noodles. 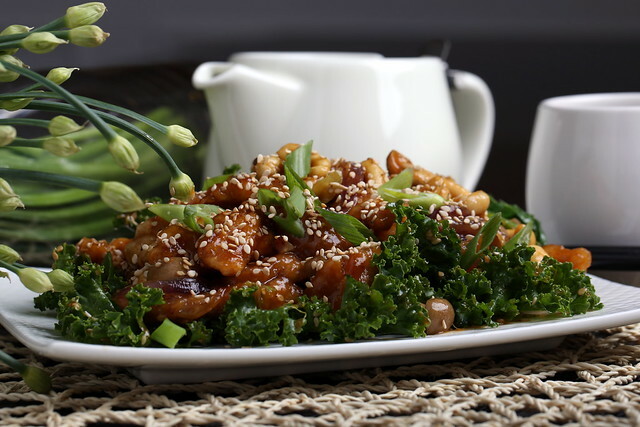 I've only liked soy curls a few ways, but I totally have to try this recipe! Thanks for sharing. Ohhhh!!!! When i first skimmed this recipe, I let out a sigh of disappointment because I saw an ingredient that I knew I would not be able to find here in Okinawa (soy curls). However, your recipe looks so delicious, and I am such a fan of your creations, that I did a Google search after reading that they were dehydrated (which would make it possible to ship). Miraculously, Butler Foods now offers online orders and shipping! How lucky am I??? Especially with the description of your husband's approval- I must try this recipe! I will order this product in the coming week, and will report the results once i have the opportunity to make it! Thank you! Leila, Soy curls are a fantastic product, so I'm glad that you can have them shipped to Japan! I hope you enjoy them and the recipe — thank you for trying it out … Happy holidays! *blush* I am so excited that you made this Leila, and it was a hit with your family! Soy curls are an amazing product — gives that meaty bite that even my husband loves as well. Happy Valentine' Day! Ooh yum, that looks fab! I'll have to do some searching for those soy curls, never heard of them before! 7 bags! Aren't you lucky! I will have to look up those recipes — I love Bryanna's recipes too … enjoy! This looks delicious! I must say that I absolutely love your recipes. I'll have to pick up a bag of soy curls and try this one out! Thank you for your kind words, Lauren — I hope you enjoy the recipe! This looks fantastic! I've been craving Soy Curls for the past couple of days, and this is calling out to me in a major way. When you say sesame oil, should I use toasted or plain? Thanks Cadry! Either type of sesame oil will work here — I personally like the taste of toasted sesame oil with sriracha over plain. I hope you enjoy the recipe and happy holidays! Mmm this looks wonderful! I just might have to try this! Looks awesomely sticky, chewy and delicious. Wonder if I can get soy curls in London? I can hardly wait to make this recipe. My soy curls have shipped!! FYI… for those of you having trouble finding them, you can buy them from Amazon.com. You can buy an 8 oz bag for $8.27 or a 6-pack for $35.95 (both items eligible for free shipping when ordering $25 worth of stuff). Yay!! Just made this last night. SO GOOD. I'm sad it's gone. I tried your soy curls recipe for vegan buffalo wings and it was beyond delicious. I also think it would be great to add a few tips about deep frying for those unfamiliar – I got a few small burns from splattering oil and made a huge mess.